The best Christmas decorations can be found in Lighted Christmas garlands. They are a staple in every home during the holiday season. This is the Elegant Christmas garland with lights you've been looking for. Both an outdoor garland for front door use and indoor lighted garland for mantle or banister use. Either way, it's sure to be an indoor Christmas decorations show stopper. The unique - handcrafted design of our red poinsettia flowers, berries, and white and green foliage makes for an elegant modern touch of a traditional Christmas Garland. The Poinsettia decorated greenery collection is one of our newest designs and is quickly becoming one of our most popular Christmas decor items. The UV coating adds durability to withstand the outdoor weather, or hang indoors above your mantle. 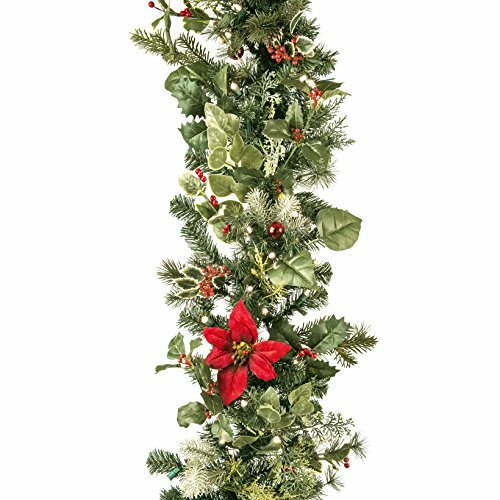 This garland with lights comes equipped with a sturdy center core which makes hanging effortless and helps maintains its durability for seasons to come. If you have any questions about this product by Village Lighting, contact us by completing and submitting the form below. If you are looking for a specif part number, please include it with your message.